The frozen waves are related to a little girl who died in a storm. At this point in the game, the protagonist is considering whether the strange world he’s exploring will let him change the past and save her. 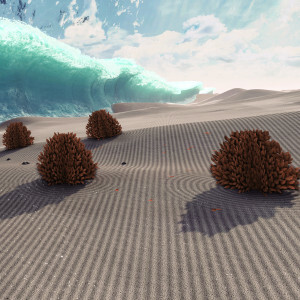 This level depicts a desert or beach, with the curling storm waves frozen above it in a moment of terror-induced paralysis, or perhaps examining a single instant divorced from the flow of time and its unbearable consequences. In addition to symbols of inevitability, waves are also agents of erasure, washing away footprints on the beach and reducing sandcastles to indistinct mounds. These frozen waves, then, represent a resistance both to the passage of time and to the numbing distance of memory. I keep calling them “frozen waves,” and the fact that I’m drawn to those words is significant. Waves are associated with summer and the beach. Note that despite the storm imagery that pervades the game, this scene begins in a sunny, clear-skied state. This is a warm scene. However, water is only motionless as ice. If not for the scattered surf, these walls of frozen water would resemble the edges of a glacier or the cleft faces of an iceberg. Of course, this isn’t actually a beach. Look at the picture above, specifically at the pattern of sand around the shrubs. It’s not the organic pattern of ripples caused by waves on sand. It’s geometric, the pattern of a karesansui, or Japanese dry garden1. These gardens of raked sand (or, more properly, gravel) are associated with meditation and contemplation. The waves looming over this landscape of calm provide a strong duality and also present a dilemma. Are the waves salty tears, threatening to disrupt the protagonist’s mental calm, a memory of trauma sweeping over and overwhelming his inner peace? Or is it the reverse: is the discipline and stillness in his mind holding the waves at bay, forcing them to remain frozen? There is definite tension there. Upon arriving in the level, a swingset is suddenly torn apart as if hit by great force. Clearly, this scene is not in perfect equilibrium, but it’s not clear which side is winning: stillness or destructive force. Position is important in Mind. Many of the puzzles require you to place a neuronal sphere in a spot marked by flowers or gears in order to change the world state from day to night or one season to another. This is often complicated by slopes that make it hard to keep the spheres in one place. The game trains you to pay attention to what happens in certain places or how things change as you move. This level begins in a hollow completely surrounded by water, evocative of the caves from earlier in the game. You then travel down a twisting passage to a more open area of the level. The roof of these segments is open to the sky, showing the large tree that is your eventual goal. After this claustrophobic space, you emerge into an open, freeing place of gently-rolling hills. 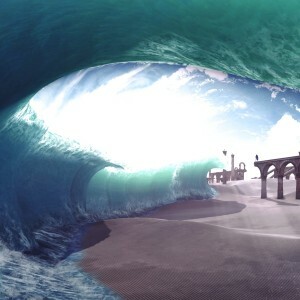 The waves form a wall of water, sweeping in the same direction you are travelling. They come from the past and are moving with implied ill intent toward the future and the tree, which has been established to represent your personal power, sanity, and ability to seize agency over your problems. This escape into the open space is, then, not an attainment of permanent freedom but a momentary pulling-ahead of an inevitable advancing threat. Some of the waves form caves or hollows, where the water curls overhead to form a roof. These places feel more threatened and confined, and they also contain some of the trickier puzzles in the level, matching the emotional difficulty of the space with the mechanical difficulty of the game. The initial soundscape of this level is gentle wind, steady surf, and the sound of children playing. However, when standing near the waves, you hear a more sinister sound: screaming crowds and the gurgling of a person struggling for air. These unpleasant sounds encourage you to avoid the waves, but there’s an even deeper thing going on here. Because the game has trained you to associate being near key points with actual changes in the world, it encourages you (the player) to believe that staying away from the water actually changes whatever events are causing those sounds. This mirrors how the protagonist refuses to confront the events in his past by fleeing from them, pursuing an impossible quest to change history rather than accept it. The game uses these unpleasant sounds and the rules it’s established to urge the player to emulate the behavior of the protagonist. Rules, theme, and story work together to bring the player and the protagonist closer together. The visual, audio, and level design of this scene serves its narrative goals, evoking the emotional and mental journey of its protagonist. The motionless waves evoke stopped time, with a contrast between their ice-like surface and the warm but contemplative sand. 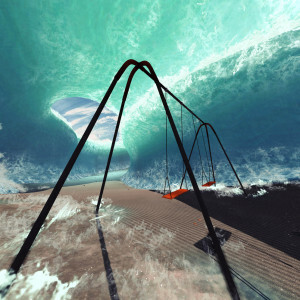 The general layout of the area mirrors the protagonist’s journey and goals and the game uses the unsettling sounds of terror and drowning to encourage you to avoid the waves just as the protagonist avoids the past. This striking scene is made even more beautiful by the meanings and allusions beneath its surface. By gazing into the waves we see the depths they hide.